To Boost Your Memory Power Fast! Meet Sixchex™! The world’s first six-way deck of playing cards designed for kids and adults consisting of 72 unique cards with different colors, symbols, pictures, letters, shapes and numbers for you to play dozens of different card games. children 6 and over, and adults. You may create your own variations to add to the growing list of unique card games! cards from Amazon. You will love it! Here are the rules for a quick fun matching game for you and your group. Sixchex! The modern six-way card game of matching letters, colors, numbers, shapes, pictures, and symbols. 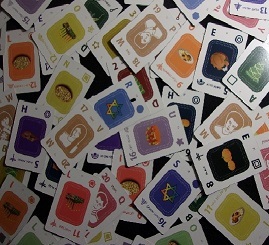 Players take turns matching four cards with the same letters, or same colors, or same numbers, or same shapes, or same pictures, or same symbols. Designate a timekeeper, or use a buzzer, to make sure each player's turn last no more than 30 seconds. (Players can set a time limit for each turn). A player may touch only 4 cards in a turn, to turn each card face up or face down, and/or re-locating in the play area. If the 4 cards match, he puts them aside and takes another turn. If 30 seconds elapse without the player matching 4 cards, play passes to the next player on the right. The first player to match six sets of 4 cards in six different categories i.e. 4 letters, 4 colors, 4 numbers, 4 shapes, 4 pictures, and 4 symbols wins the game, and yells Sixchex!!! 72 playing cards per deck. Combine 2 or more different Sixchex Edition decks for a more exciting challenge. Collect new picture editions, to feature Diversity, Pets, Fitness, Kitchen, Beauty, Money, Fashion, Health, Cars, and more. Up to 6 players, ages 6 to adult. Have fun! The standard old deck of cards has been around for over 600 years. It’s time to up your game with Sixchex™. Not only is Sixchex™ a new, expanded version of a deck of cards, it gives so many options for games and variety that it stimulates your brain in new and exciting ways. Young children can play memory games using pictures and colors while tweens can add numbers and letters. Teenagers and adults can stretch their brain by using all six categories at the same time in one card game. With Sixchex™, you can play over two dozen games from the most popular matching games to Card Hunt, Blackjack and more. Family time has never been more fun than with Sixchex™. Your youngsters will never know that these fun games are educational. But you know that these fun, family games will stimulate brain development in young kids and cognitive ability in older players. With your deck of Sixchex™, you fill find endless possibilities. The classic Sixchex™ matching game challenges you to match four colors, four numbers, four pictures, four letters, four shapes and four symbols in less than six minutes! Enjoy! Or Click Any Link Below. Sixchex™ is on sale online at Amazon. Get your copy of Sixchex™ now for a low introductory price. An amazing fun deck of 72 six-way Rainbow Playing Cards suitable for everyone in your family! You can play dozens of new card games with pictures, colors, numbers, letters, shapes, and symbols. Millions and millions of combinations to to entertain you for a long time to come! I purchased Sixchex for my 12 year old son to play with after hearing from some moms I know about how well it would stimulate his brain and mental clarity. The best part about the card game it that you get 6 different games to play all in one deck for one low price. I love knowing that he is entertained but yet is exercising his brain all at once. Highly recommend this deck of cards. Each card game is modifiable to suit the age and number of players. Young children can play games using pictures and colors while tweens can add numbers and letters. Teenagers and adults can stretch their brain by using all six categories at the same time. Sixchex™ is fun for the whole family so join and ditch your old playing cards and join the Sixchex™ revolution today! Instructions for each of these games are found here. Is your memory and mental clarity leaving a little something to be desired? There’s something you can do! It’s intellectual muscle derived from means other than experience. It’s pattern recognition, working memory, abstract thinking and calculating skills. That’s what Sixchex™ is all about… exercise for your brain that builds (and prolongs) your brain’s fitness. And that’s one reason Joseph Daniels, a former science teacher, created this game for his students. You can write your own game rules to play with the 72 Six-Way Rainbow Playing Cards and post them online with your name and business or hobby website link. Express yourself! The sky is the limit. You can use your imagination to create word games, number games, color games, picture games, and much more, using one or more decks of the amazing Sixchex™ Six-Way Rainbow Playing Cards! Gather your family and friends together for a creative session of fun! Get My Amazing Six-Way Rainbow Playing Cards Today! Hello, my name is Joseph Daniels, and as part of an international promotion, I would like to send you my new six-way Rainbow Card Game Sixchex™ for a low introductory price. It includes a tuck box containing a deck of 72 Rainbow Playing Cards, and Game Rules for a six-way card matching game. Rules for dozens of new six-way card games will be posted online at sixchex.com, and can also be emailed to you FREE. You may also be among the first Sixchex™ players to collect every new edition of the Rainbow card games; featuring pictures of dating, diet, fitness, holidays, advertising, money, professions, sponsors, sports, and much more. Now, you can play the exciting matching game FREE online at sixchex.com or play the app Sixchex™ Six-Way Matching Card Game on your smartphone or tablet. If you can excel at six-dimension Sixchex™ card games, imagine how excellent you will be at playing ordinary card games like Rummy, Poker, Blackjack and more! 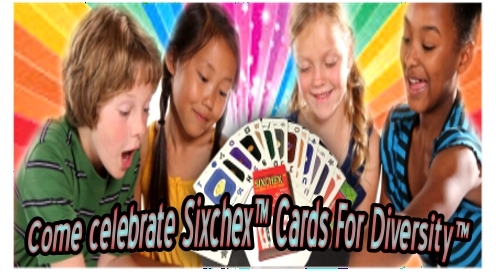 There are millions and millions of possible combinations with Sixchex™ six-way rainbow card games to improve your gaming skills faster than anything else on the market. You get a real physical card game sent to you via the mail for a low introductory price. You get game rules for dozens of variations of Sixchex™, be available online. You can also network with Sixchex™ players from everywhere so you can exchange tips, and share your creativity. You and your family can easily create and share your own game rules to play with one or more decks of Sixchex™ Rainbow Playing Cards. The inventor, Joseph A. Daniels is a former Science Teacher and Critical Care Nurse who has used his experiences to design card games and board games to challenge your brain power for a long time to come! He has improved ordinary playing cards by adding more cards, more symbols, more colors, and more variations to expand your brain and to entertain you and your family, ages 6 and up. With this card game, you will obtain improved concentration, increased creativity, greater clarity of thinking, intensified access to emotions and amplified states of well-being. When you buy card games like UNO®, Five Crowns™, Phase 10®, Blink®, Wizard®, SkipBo®, and others with other manufacturers trademarks, you may get only one card game; but with Sixchex™, you are getting dozens of card games in one for one low price, plus you can create your own game rules to play with the Six-Way Rainbow Playing Cards to share with your family and friends! …You can design your own six-way card games and share them online with the Sixchex™ community, adding your URL of your own business interests or hobbies. …Play “Psychol™”to discover your color cycle; for example if you collect mostly the red cards, that means that you are Exciting, Active, Passionate, Stimulating, Confident, and Dynamic. …Play “Magic16™”to make a Magic Square arranging 16 cards in 4 rows so that the total of each row, vertically, horizontally and diagonally, is 34. …Play “SuperMatch™”card game to match 8 cards at a time. …Play “Top Twenty™”to collect the cards with Play Numbers 1 through 20. …Play ”Spectrum™”to capture your opponent’s coins or chips provided by the players. …Play ”Split-Count™”to accumulate cards with specific symbols assigned to each player. …Play “Card Hunt™”to find 16 specific specificRainbow Playing cards. …Play “Oreno™”card game to win up to 2 million points by correctly guessing specific symbols on the facedown cards. …Play “Pyramord™”to use the letters on your cards to make a list of words with each new word being as long as, or one letter longer than the preceding word. …Play “Blackjack34™”card game in which your goal is 34 points instead of 21. …Play "Tinabo-4-Sixchex™”...in which the player who first disposes of his HOME PILE is the winner! …….and much more to increase your mental luminosity! Take advantage of this international introductory campaign and grab my Sixchex™ Rainbow Six-Way Card Game at a low introductory price for a limited time, before the price increases to $20. This exciting fun pack is multi-color printed, cellophane-wrapped and inserted into a tuck box with game rules for you to play a six-way card-matching game of numbers, letters, colors, pictures, shapes, and symbols. 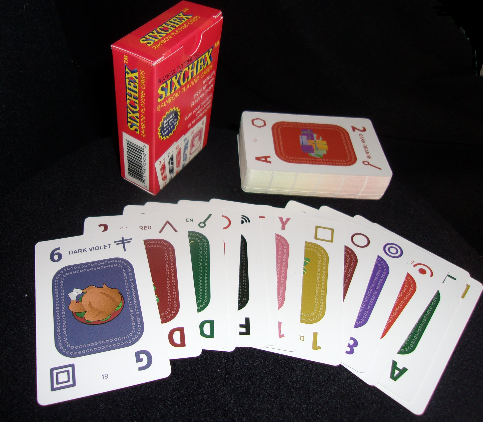 You can play dozens of other six-way card games with rules which will be sent to you by email, and also posted online at sixchex.com. You can easily create your own card game to play with the 72 Six-Way Rainbow Playing Cards and share them online with the Sixchex™ community, adding your own name and URL for your hobbies or business interests to make more friends. Take one small step to greatly magnify your mental luminosity now! Hurry and get your fun pack today for a low introductory price for a limited time. Hurry up and get your fun pack today for a low introductory price for a limited time.